The Social Network Visualizer project happily released today a brand new version of our favorite social network analysis and visualization tool. SocNetV version 2.5, codenamed “maniac”, brings new features and improvements (i.e. custom node icons) and it is as usually available for Windows, MacOS and Linux. Go to the project’s Downloads page and get it! The Social Network Visualizer project has released a brand new version of our favorite social network analysis and visualization software application. SocNetV version 2.4, released on Feb 28, is a major upgrade bringing lots of new features, such as Kamada-Kawai FDP layout. The new version is available for Windows, Mac OS X and Linux as usual. Linux user may download a very light AppImage — just click it to run the app! 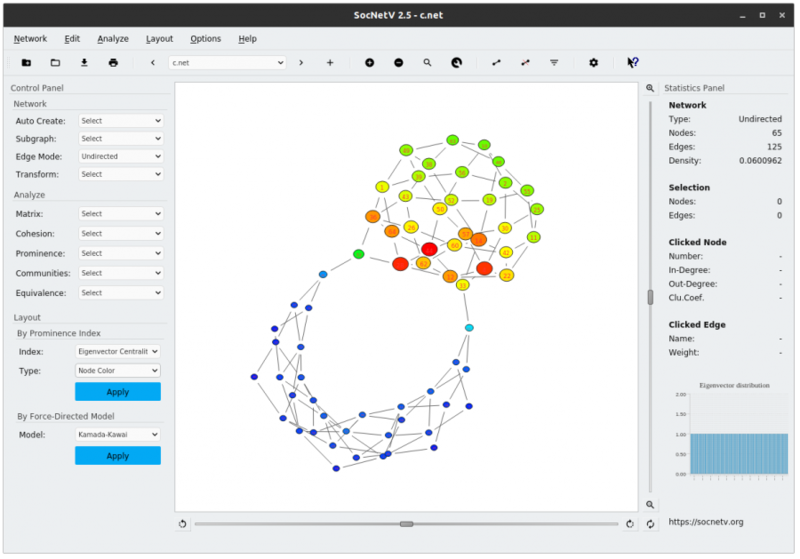 Your favorite social network analysis & visualization free software project, Social Network Visualizer, has released a new version. SocNetV v2.1 has the quite eloquent codename “fixer” and it is available for Windows, Mac OS X and Linux from the project’s Downloads page. See some nice screenshots of SocNetV in action. 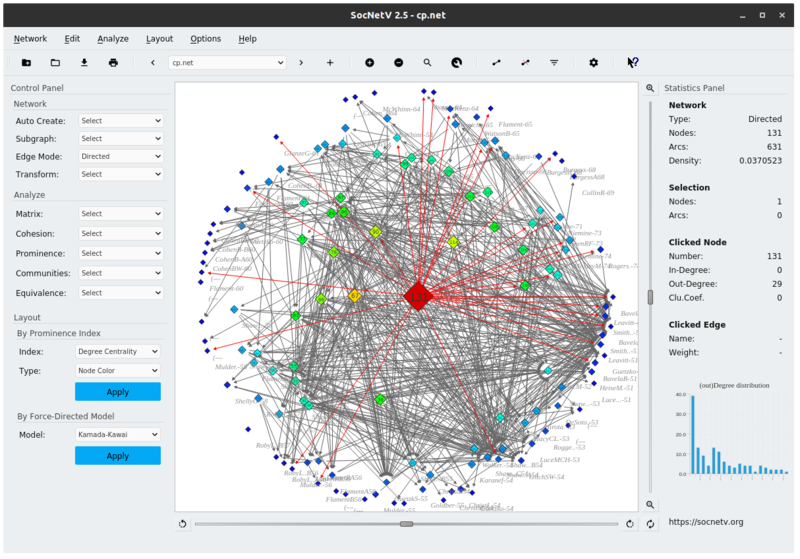 I am happy to announce a new major release of Social Network Visualizer (SocNetV), the Social Network Analysis software. SocNetV v2.0 comes with a major code overhaul for stability and performance boost, improved GUI with a new panels layout, and nice new features for easier social network analysis, such as separate modes for graphs and digraphs, permanent settings/preferences functionality, edge labeling, recent files, keyboard shortcuts, etc. Also there are improvements in Force-Directed layouts, i.e. Fructherman-Reingold. The new version supports Windows, Linux and Mac OS X. Binary installers and source code packages are available from the project’s Download page. See below a walk-through of the new features. SocNetV version 1.9 is here, with LU decomposition and a Qt showcase! Another release has just emerged from the depths of the Social Network Visualizer project! The new version 1.9 fixes important bugs and brings a vastly improved matrix inverse algorithm, thanks to the newly implemented LU decomposition. Of course, the new algorithm speeds up all other routines which depend on the inverse of a matrix, such as the Information Centrality algorithm. Also, SocNetV v1.9 brings a revamped -and corrected- PageRank Prestige routine. Up to v1.8, the PageRank algorithm was using the original Page&Brin formula which lead to somewhat different results compared to other SNA applications. From this version, SocNetV uses the correct formula and computes comparable results (yes, we tested :)). Source code, Windows zipped executables, Mac OS image and binary packages for major Linux distributions are as always available from the project’s Downloads page. Have fun with the new release! Also, I am happy to report that the Qt project has added SocNetV to its ‘showroom’ page, along with many other nice Qt applications. There is also a showroom page dedicated to SocNetV with nice screenshots and a brief description of the application. Kudos to Kojo Tero, of Qt Company, for this! SocNetV v1.6 released – a nice web crawler included! 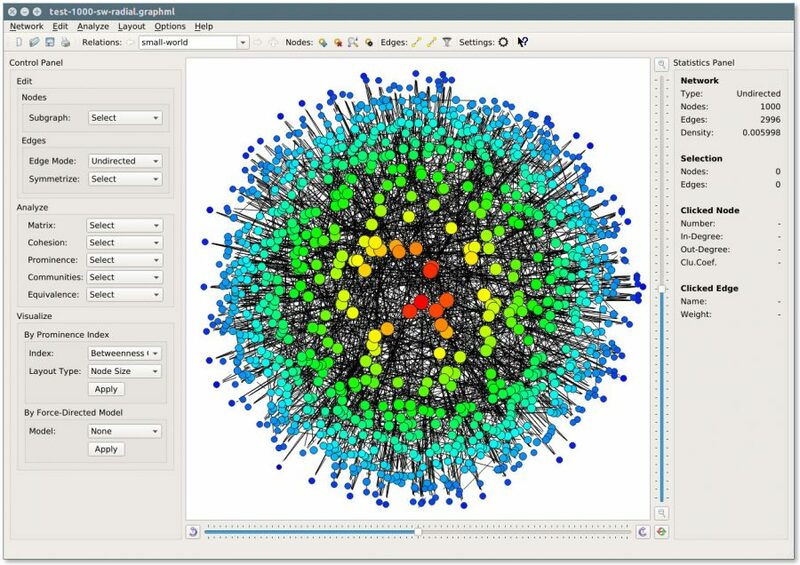 The Social Network Visualizer project has just released its latest version 1.6. This new version brings back the web crawler feature, which has been disabled in the 1.x series so far, but in a much more improved form.